The month of February is here once again. And it is time for children to go back to school. For some it is their first day at school. For others it is like going back to their second home. Some children would have just turned six years old this February. Some may have added a few additional years in their age so that they can attend school and start early. These are the children of some sensible parents, who think ahead of their friends and colleagues for they understand the importance of starting early. 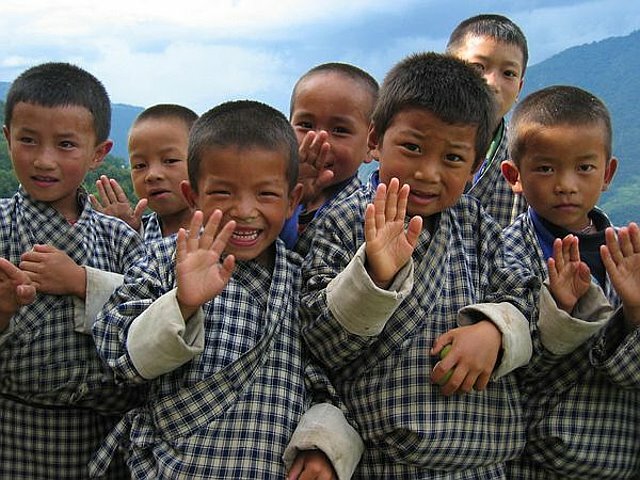 In Bhutan the accepted official enrollment age of children is maintained at six years. While some principals interpret the rule liberally or semi-liberally, there are others who follow the enrollment age policy like a holy scripture. The former category of principals relax the enrollment age a bit so that even a child who is a few months short of school going age is also admitted in the school. But the latter rejects a child’s admission even if the child is short of a month or two. And now when the child is finally grown enough to be admitted in school, which would obviously be only in the following year, the child would be more than seven or eight months older than his/her classmates. What will happen to the child’s psychology? When it comes to faking of children’s birth certificate, our parents fall into two categories – literate and illiterate. Illiterate parents can never (my assumption) create a favorable condition, which would allow them to change their children’s age. In fact for them, if their children can go to school at any point in time, they think it is all right. Not their literate counterparts. And then the school enrollment age policy is not followed strictly in some schools; it is followed strictly only with the children whose parents cannot trick the school authority in believing that their children is ready for school. Some principals felt that we need to lower the age of enrollment to five years, but their requests were simply shot down during some annual conferences. So, why do parents fake their children’s age? The answer is quite obvious. In places like Thimphu admission pressure is so much that the school authorities literally have nightmares when it is time for new admission. And it is in this context that enrollment age policy comes in handy. But we are told that once the child is admitted, his/her age is dully corrected! However, I don’t see any connection in remote schools not having enough children and the school authorities strictly interpreting the rule. We have had enough reports in the media that informed us of many schools in the remote areas being downgraded to extended classrooms. Of course we are told that now the government is coming out with a policy that says if the children upon the completion of class 10 or 12 do not attain a certain age, say 16 or 17, they would not be eligible to for professional courses in the third country. Hopefully, that would reduce the number of parents faking their children’s age. But even with the policy, I see parents bringing down the age of their children once they are admitted. If it is possible to add a few years in a child’s age, then it should be equally possible to subtract a few years! I consider this enrollment age irrelevant, especially in urban centers where private nursery schools abound. And of course how many parents can afford to send their children to expensive nursery schools? Parents in the urban centers admit their children when they are not more than three years old in nursery schools. And after these children spend a year in the nursery, based on their performance and learning ability in the nursery classes, they are placed in the preprimary (PP) classes the following year. This means by the time the child is four years old, he/she actually gets to start school, which is not in agreement with the enrollment age policy that we so much insist upon. And their remote cousins have to wait until they fully attain six years. Blame it on the absence of nursery schools! One is made to feel that laws are applied strictly in some cases while they are blatantly overlooked elsewhere. Implement it or ignore? It’ll be better if the age limit for the professional courses for third country is implemented. Only problem in the society is with the educated lord!! They understand and act in your own ways!! You are inspering writer in the WAB. I never miss to read any one of your splendid article.you really deserved slute. Beginning of a New Year?